Your home is one of the most expensive investments you have. 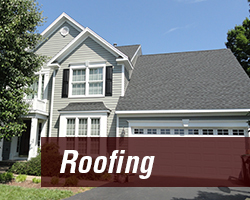 Your roof is the first line of defense against the Maryland rain storms and winter snow storms. Your roof requires attention from time to time and when it does you should contact Metropolitan Design/Build for a quality roof inspection. Our professionally trained roof technicians will inspect your roof for any signs of leaks and will carefully prepare a report that explains exactly what is required to continue to keep your roof in good shape. No matter how minor or major your roofing needs are, we have a wealth of roofing experience and knowledge so that you can be assured that the job will be performed properly and in a timely fashion. If you need a roof inspection contact us at (301) 870-2145 or use our contact form on this page to schedule an on-site roof inspection. Our prices are competitive and service is unmatched. Is your roof ten years old or more? Do you want to change the look of your roof? If you need a replacement roof Metropolitan Design/Build can help. No matter what condition your homes roof may be in our team of roofing pros can replace it quickly and affordably. We use quality roofing products and materials that are backed with real warranties. Our GAF certified roof technicians are trained in the best methods for roof installations which will provide you with a worry-free roof system for years to come. We have more than two decades of experience replacing roofs for homeowners in Gaithersburg, Maryland and surrounding communities. We have established ourselves as a leading trusted roofing contractor for countless homeowners. We have experience replacing roofs on every type of roof and style throughout the Gaithersburg area. Choosing Metropolitan Design/Build will be one of the best roofing replacement decisions you can make. We have an extensive background in the roofing industry and provide roofing systems from the leading roofing manufacturers. Your roofing job will be installed properly and will last for years. Our roof technicians work quickly and will complete the job on time without mishaps. We have replaced countless roofs in the area and know how it’s done because we are professionals. Metropolitan Design/Build is fully licensed, bonded and insured in Maryland, DC, and Virginia. Our customer service is levels above others in our industry. By choosing us, you are choosing a Maryland roofing company that you can trust. The weather can swing wildly from season to season. We experience harsh winter storms with blizzard conditions, ice and hail, taking its toll on many homes roofs. The scorching high heat in our summers also wreak havoc on roofs not to mention the occasional hurricanes that blow through the region. When these passing storms do their number on us, many times they leave damage in their wake. When you have a roof repair that needs to be addressed it never comes at a preferred time. No worries. Contact Metropolitan Design/Build and we will respond quickly and make professional repairs. 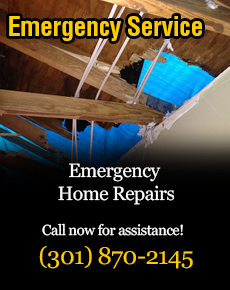 We provide emergency roofing services to Gaithersburg, MD homeowners and will do everything in our power to repair your roof quickly so that you are protected from Mother Nature’s elements twelve months a year, year after year. Weather your roof repair is major or minor Metropolitan Design/Build can inspect the roof situation and the extent of the roof damage and provide you with a detailed explanation of repairs. We do everything in our power to make repairs quickly and if need be, help you replace your roof within a budget that is affordable. Don’t hesitate contact us at (301) 870-2145 or complete the online form on this page to schedule a roof inspection or roof repair. Metropolitan Design/Build first and for most performs roofing services; but we also provide many other exterior home improvements and services. We provide seamless gutter replacements, siding installations, vinyl and aluminum trim, as well as soffits and cultured stone facades. Our professional installers can provide you the best service and quality unmatched by other businesses in the industry. If you live in Gaithersburg, MD and need exterior improvements or work on the exterior of your home, contact us and we will be glad to discuss your project with you.